"California Schemin'!" Part 1 of 2. Script by David Michelinie. Pencils by Todd McFarlane. Finishes by Joe Rubinstein. 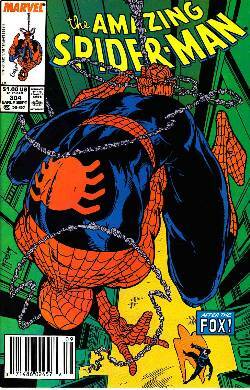 Cover by Todd McFarlane. The Daily Bugle publishes a book featuring Peter Parker's best photos of Spider-Man! And now the Bugle's ace photographer and Mary Jane are on their way to Los Angeles for the publicity tour! It should be all fun in the sun in the city of angels! But Peter's first promotional event at the L.A. civic center hits a snag when an old acquaintance shows up: the Black Fox! The wily fox steals a priceless chalice and the chase is on! Is the web-slinger ready for his Hollywood debut?